Norway is the destination for your adventure of a lifetime. See the spectacular jaw-dropping fjords and glaciers, get a close-up of the legacy of the Vikings and go on the most picturesque train ride in Europe. Welcome to the fabulous capital of Norway - Oslo! Your driver meets you at the airport and transfers you to your centrally located hotel. The rest of the day is free so you can start exploring the magnificent city center on your own, dine in one of the local restaurants or take a good rest in your comfortable room. Pre-tour extension available: If you'd like to extend your Scandinavian journey, we recommend going to Copenhagen, one of the most charming, healthy and colorful capitals in Europe. Contact your travel specialist for details. After breakfast you meet your private guide at the hotel lobby and go on a 5-hour guided city tour of the magnificent Norwegian capital. You start with a visit to one of the major Scandinavian treasures - the famous Frogner Park, informally known as the Vigeland Park named after its founder Gustav Vigeland. You spend some great time strolling through this beautiful park and enjoying its extravagant sculptures and unique Scandinavian nature. Then you proceed to other famous Oslo attractions, including the Norwegian Folk Museum and the Viking Ship Museum (tickets are included). After the tour you return to your hotel and have the rest of the day free. Spend a relaxing evening on board and enjoy the beautiful sceneries of the nearby islands, whilst savoring the fresh flavor of local shrimp. Following breakfast you check out from your hotel and walk to the train station (easily accessible by foot), where you board a train that takes you to an unforgettable Oslo - Myrdal - Flam rail ride. This trip is a perfect chance to admire the mind-boggling nature and picture-postcard sceneries of Norway. The duration of your trip is about 6 hours. Upon arrival you walk to your hotel to take some rest and relax. In the evening we invite you to visit the local Ægir BrewPub in Flam to enjoy a traditional Ægir Viking plank. This is a special 5-course food tasting dinner served with 5 different Ægir beers (included in the price). You have the chance to taste the Norwegian delicacies paired with the Ægir beers. Breakfast, dinner and beer tasting included. After breakfast you check out from your hotel and have the rest of the morning free to spend at your leisure or join our carefully-prepared optional tour. We invite you today to take off on an incredible adventure - to enjoy a 2-hour group Heritage Fjordsafari with rib boat. Have a Viking experience and exciting journey which will take you back over a thousand years in time to a real Viking Village. Go on an exclusive guided tour and explore true Norwegian traditions in the tiny fjord-village Undredal, famous for its goat cheese, architecture. In the afternoon walk to the pier to enjoy an express boat ride to the charming town of Balestrand that is set in a truly magical location nearby Norway's largest fjord - Sognefjord (trip duration: 1,5 hours). Upon arrival you walk to your hotel located very close to the pier and have the rest of the day free to explore the village by yourself and enjoy its unique atmosphere of silence, relaxation and luxury. After breakfast you check out from your hotel and meet your guide - driver who takes you on an unforgettable journey to one of the world's most famous glaciers - Briksdal Glacier. Surrounded by the roaring waterfalls, fertile valleys and mighty mountains it offers one of the most awe-inspiring natural scenery in Norway! You stop by the Briksdal Glacier to take memorable photographs and enjoy the magnificent views. During the trip you also enjoy buffet lunch at the local cafe and have a few photo stops along the scenic drive, so make sure to take a lot of photographs to share with your friends and family later on. After the tour you are transferred to the spectacular Geiranger village located nearby the UNESCO-listed Geirangerfjord that is one of the most visited tourist attractions in Norway. Upon arrival you check-in to your remarkable hotel providing magnificent fjord views and have a traditional dinner at the hotel restaurant with your fellow travelers. After breakfast you have the morning is free to relax in the Union Bad swimming pool and sauna of your hotel or explore the charming village of Geiranger on your own. 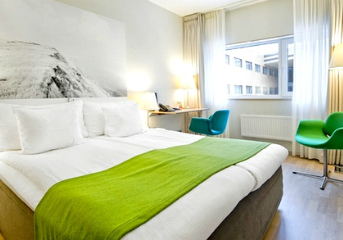 Nearby the hotel you can enjoy the Fossevandring cascading waterfall from the top or take the stairs down to the pier to see the whole power of the falls, or visit the Norwegian Fjord Center. In the afternoon you check out from your hotel and your driver transfers you to the port where you board a comfortable Hurtigruten ship to enjoy a fantastic Geirangerfjord cruise to Alesund that provides you with the unique chance to admire spectacular Norwegian sceneries and mind-boggling fjords. The duration of your trip is about 5 hours. Upon arrival to Alesund you go to your centrally located hotel for check-in. The rest of the day is at your leisure. Have a wonderful evening enjoying a 3-course dinner at the XL diner, known as Europe's largest bacalao restaurant, with main expertise in clipfish perfection. Following breakfast you meet your private guide and enjoy a wonderful 3-hour walking tour. The town was completely rebuilt after the great fire of Alesund happened in 1904. Now Alesund is a wonderful example of Art Nouveau architecture. During the tour you see Alesund Church and the Alesund Park, the Town Hall and many other outstanding attractions of the town. After the tour you return to your hotel and have the rest of the day free. You can continue exploring this beautiful city by yourself. Set off on a 2,5-hour afternoon introduction to the Art Nouveau town of Alesund on a kayaking trip, perfect even for beginners. Immerse yourself in the stunning beauty of Norway's nature during the exciting 2-hour Wildlife Sea Safari. Experience the fjords, mountains and waterfalls with the Bergen - Mostraumen fjord cruise. Travel to the innermost part of the Osterfjord, right into the narrow Mostraumen. After breakfast you check out from your hotel and your driver transfers you to the airport for your flight to Bergen - the second largest city in Norway (flight tickets are included). The duration of your flight is about 1 hour. Upon arrival your driver transfers you to your centrally located hotel to leave your luggage. You then go on a 3-hour guided walking tour around the most interesting sights of Bergen. During the tour you also enjoy a fantastic Floibanen Funicular ride that is one of Norway's best-known attractions. The rest of the day is free for you to dine in one of the local restaurants or just take a leisurely walk around the city. This is the last day of your amazing Norwegian adventure! After breakfast you check out from your hotel and your driver transfers you to the airport for your flight home. We wish you a safe flight and hope to work on your future trips! Post-tour extension available: Enrich your journey and continue your trip with an extension to Iceland, a unique destination with untouched nature, breathtaking landscapes, and vibrant culture. Contact your travel specialist for details. Emergency line support during the trip. Not included: international flights, other meals not mentioned in the program, optional tours and services, all personal expenses. Scandinavian climate is unpredictable and weather can be quite harsh even during summers. 2020 Early Bird Special: Book now and secure 2019 rates. Tours start every Saturday from May 30 to August 22, 2020. Our Ultimate Norway Highlights (Norway in a Nutshell) was in a word .... Superb!!! It was the most wonderful, most organized, most memorable no-worry trip we have ever had! It was the most wonderful, most organized, most memorable no-worry trip we have ever had (to say the least)!